The screenshot above is hosted and provided by eximioussoft.com. Please contact them directly for any copyright infringement as we are not responsible for that content. 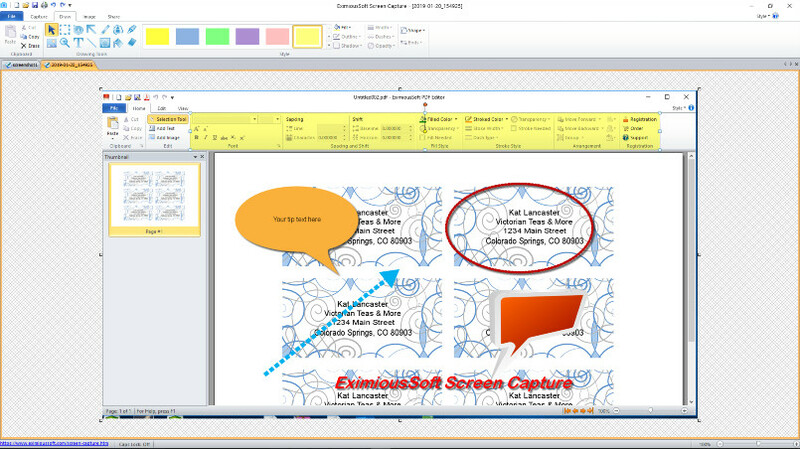 EximiousSoft Screen Capture is a full featured screen capture software with advanced image editing utilities. It allows you to take screen shots of various regions, documents, or even specific windows on your desktop using a combination of technologies like hotkeys and its shortcut buttons. you can also edit in several ways, apply effects to enhance communication and share easily. Put text, lines, arrows, translucent shapes to illustrate your ideas easily and effectively. Save your work in popular image formats (jpg, gif, bmp, png) or email it or paste to your presentations, manuals, marketing materials, web pages. Capture any part of your PC screen, scrolling windows and entire web pages, in rectangular, circular, or freehand shape. Capture any program's menus with mouse cursor. Easily add stunning effects to your image. Draw attention with arrows, callouts, sensitive information with a blur, add a text callout or torn edge effect to your captures, and so much more. You can save your capture in popular image formats like bmp, jpg, gif, png, tiff, tga, pdf etc. print or paste it to MS Word, Power Point, Excel documentations.